I am unable to set the orientation correctly. Switching between portrait and landscape does not help. The following is an overview of the orientation setting for the LX800 Windows printer driver. Keep in mind that you should only be changing the orientation so that you can view a label right side up on the computer screen. You can accomplish the same printing result by leaving the orientation set to portrait and rotating individual objects 90 degrees on screen. 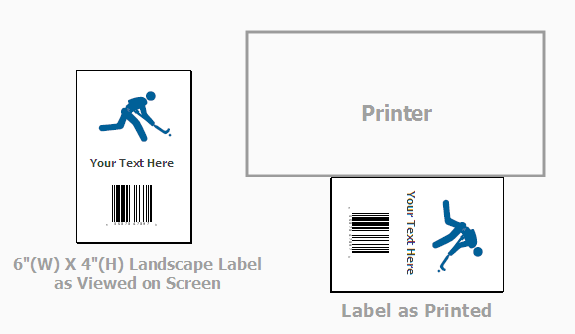 This is much more intuitive since the printer will print as you view the label. However, some programs do not allow you to rotate text and graphic objects. Change object orientation in Nice Label by selecting the object and clicking the rotate button on the left toolbar. Important! 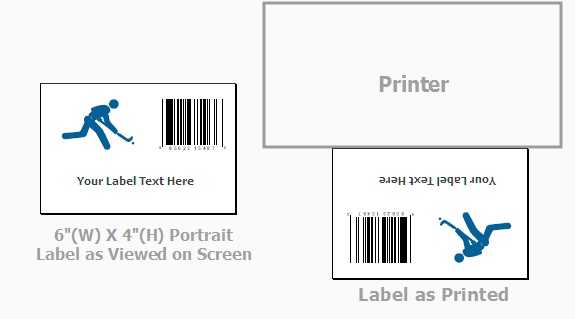 Regardless of orientation, always set Paper Size in the printer preferences to the width and height of the label as it is installed in the printer. Width = distance left to right, Height = distance front to back. Set the orientation through printer settings in the software application you are using. If you are using Nice Label the label setup wizard prompts you for paper size and orientation. Confirm the orientation by clicking on the printer settings icon on the toolbar. Programs other than Nice Label such as Adobe Illustrator or Photoshop may require you to set your page size to the opposite values as the paper size set in the driver. In order to print an image in landscape mode to a 6" (w) X 4" (h) label you may have to set your page size/image size to 4" (w) x 6" (h) and then change the orientation in the driver to landscape. Page size in Adobe Illustrator can be found under the File menu - Document Setup. Image size in Photoshop can be found under the Image menu - Image size. The following diagrams illustrate the difference between portrait and landscape as they appear on screen and as they are printed. Note: Width and Height refer to the Paper Size setting in the printer driver.